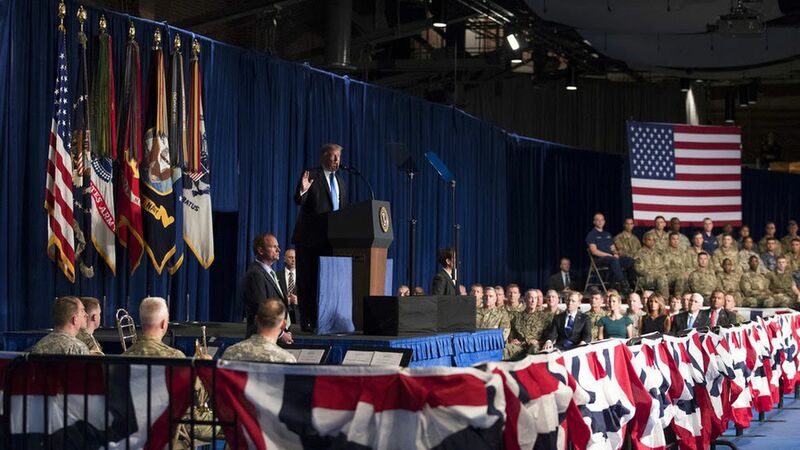 President Trump chose normal over instinct when he yielded to his generals on Afghanistan policy, providing yet another reminder of the frequent disconnect between what he says and what he does. In a highly symbolic decision unfurled in his first prime-time policy address, Trump sided with SecDef Jim Mattis in approving a modest increase in troops. But Trump gave no number, which was flagged as disingenuous by Jeremy Bash, a CIA and Pentagon chief of staff during the Obama administration. Bash on MSNBC: "In Afghanistan, ... we are part of a 39-member, NATO-led coalition. It's inconceivable that we will deploy troops there, tell the Afghan government the number, tell 39 other nations the number ... but not tell the American people. ... In some ways, you do have to telegraph to our friends, as well as our adversaries, our commitment to Afghanistan over the long term." In 2013, Trump called for "a speedy withdrawal," and later tweeted: "Let's get out!" David Ignatius on "Morning Joe": "There's very little enthusiasm for this policy ... in the Pentagon, but ... not a single person there, really, can bear the thought of walking away." A Republican close to the West Wing gave this snap appraisal: "He seemed emotionally committed to his words. Very little ad-libbing or free form. His bearing was serious and as 'Presidential' as he is capable of conveying. Hill Republicans are skeptical about his staying power once the base reacts to his policy about face. It was a conventional R hawk speech, unveiling a conventional R hawk policy." Axios' Jonathan Swan, who reports that the speechwriting was led by Stephen Miller, emails: "Would President Hillary Clinton or President Marco Rubio have given a different speech? Maybe in some of the rhetorical flourishes and framing, but the substance is what matters and Trump sided with the national security establishment tonight." "It was the language of populist nationalism used to sell a very mainstream, consensus, national security strategy." The president couldn't sneak this past Customs. The N.Y. Times reports that "top national security officials were ... taken aback at a meeting in the Situation Room on July 19, when an angry Mr. Trump began ripping apart their latest proposal to send thousands of additional American troops to the country." At that point, Steve Bannon thought he was winning. There were instant signals the decision could mean trouble with the base. Breitbart News called it a "flip-flop" in a huge red headline, and conservative radio host Laura Ingraham tweeted: "Who's going to pay for it? What is our measure of success? We didn't win with 100K troops. How will we win with 4,000 more?" Swan reports: "Breitbart will go big on this. It's everything Bannon fought against. They'll attack Trump for selling out his base and being a third term of Obama. Also, you can quote this from a high-profile Trump supporter: 'Trump just succumbed to the false song of globalism.'" "The big policy moves — rejecting a timeline-driven approach in favor of one based on conditions on the ground, promising a more coercive approach on Pakistan's sheltering of terrorists — mark a rejection of the mistakes made by President Trump's predecessors that contributed to the stalemate he inherited." "[T]he question is whether the commitment is real and persists — whether he really takes ownership for the policy and continues to make an affirmative case to the American people about why we have vital national interests in South Asia and can't afford to walk away." Be smart: Remember all the praise for President Trump's stick-to-the-script address to Congress back in February? Tonight in Phoenix, Trump has a "Make America Great Again" campaign rally. Normal may not be in town for too long. Go deeper: Dave Lawler's speech highlights.